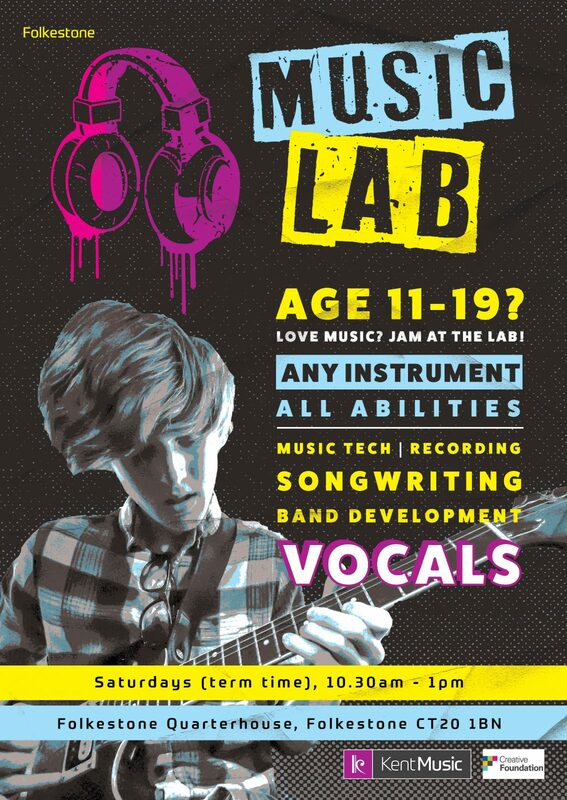 Folkestone Music Lab is a creative space for young people aged 11-19 to work on band development, music technology and production, singing and instrumental skills, songwriting and more. No matter what your style, ability or interest – you might be a budding sound engineer, want to play jazz, rock or classical music – we will make every effort to provide for you. If we don’t have what you want, tell us and we will provide it! The Music Lab is committed to Youth Voice and we want our members to have a big say in how it develops and what it does each week. All sessions are supported by a team of professional tutors and pastoral staff. The Lab launched in 2017, and is a collaboration between Kent Music and Creative Folkestone. We welcome enquiries for instrumental lessons at Folkestone Music Lab. Please use the button below to make an enquiry. Bruce has been playing acoustic, electronic drum kits and hand drums for over 25 years. He has played in bands across the UK and toured Europe, recording many albums with artists along the way. Bruce is a working drummer who is regularly involved with artists including: The Turpin Hubbard Band (Blues), Mampama (Highlife), Gumboots Reggae band and The Desert Turkeys (Gypsy Jazz). He performs regularly with these different bands across Kent, Sussex and London. Bruce also teaches drum students of all ages and abilities from beginners, those taking graded exams, and to some established drummers working in their own bands. Robin File has been playing and producing music since the early 90’s, always with a leaning towards doing something different. His first band The Sugar Merchants were signed to Chrysalis publishing in 1992 and to Elektra (USA) in 1993. They went on to record an album with producer (Robin Millar-Sade, Fine Young Cannibals) only to find themselves part of a corporate takeover by Time Warner and eventually shelved by the label. Already Robin was learning the hard realities of the music business. Knocked but undeterred the band slimmed down from 6 to 4 and became Audioweb, with a leaner harder edged sound fusing Reggae, Hip Hop, Dub and Rock. 1995 saw them sign to U2’s label Mother Records after some new demos and only a handful of gigs. Two albums followed (Audioweb & Fireworks City), appearances on “Later With Jools Holland” and touring headlining and supporting acts such as U2 and The Fun Lovin’ Criminals. Ian Brown (The Stone Roses) became their most public supporter and even though their music was challenging, the band enjoyed success until 1999 when they decided to have a break, which lasted 17 years until reforming summer 2016 to play support for The Stone Roses at the Etihad Stadium. Post 2004 saw a spell with Finley Quaye and the start of of Robin’s move into education providing Rock/Indie workshops and engineering/production tutoring which he is doing to this day. Currently Robin is playing and recording for junglist legend Congo Natty. Nick is a classically trained musician, multi instrumentalist and music producer, with over 20 years experience as a music teacher. He has a wealth of industry experience as a recording artist, touring performer and sound engineer at venues and festivals across Europe. Nick currently teaches piano, keyboards, drums, guitar, band development, music technology and early years development based on the Dalcroze principals of learning. Sophie began receiving musical tuition at a very early age, realising at aged nine that she wished to pursue a career as a pianist and an opera singer. Sophie’s musical studies have taken her to venues around the UK, France and Spain. In 2009 whilst living in Spain, Sophie was granted a Scholarship to study at both the Royal Superior Conservatoire of Madrid and the Superior Opera College where she studied her degree in both piano and voice. Sophie has worked for the education sector since 2005 specialising in music and languages and is currently a French and Spanish teacher at Canterbury Academy. In between having endless fun with her two dogs and learning Polish, Sophie has a passion for languages and dancing and spends her spare time doing salsa, bachata, kizomba and rock n roll! Oliver is a skilled musician with diverse experience within the music business, including extensive knowledge of composing, producing and performing. He has his own recording studio and has released music on various independent record labels. Together with colleagues, he has assisted with the organisation of numerous music festivals and events and regularly performs at diverse music venues including world-class music settings such as ‘The Roundhouse’ Camden, London. Oliver strongly believes in the power that music holds in helping young peoples’ emotional well-being. With this in mind, alongside his other commitments, he also undertakes freelance music technology and production work and intergeneration community projects. He has delivered over a hundred music workshops in conjunction with schools, charities and specialist companies. These sessions have contributed in various ways towards supporting vulnerable groups in our community, from asylum-seekers to those with special educational needs such as autism. Matthew has over 20 years professional experience as an audio engineer, producer, remixer and educator, working with a wide range of industry professionals including Living Colour, Congo Natty, and Adrian Sherwood. He specialises in Music Technology and is expert in Pro Tools, Logic X and Ableton Live applications and loves working with all kinds of music. More information can be found at www.matthewsmyth.co.uk. There is a £2 charge per session. We offer a 75% discount for those meeting specific financial criteria. Please visit our Financial Assistance page for details.